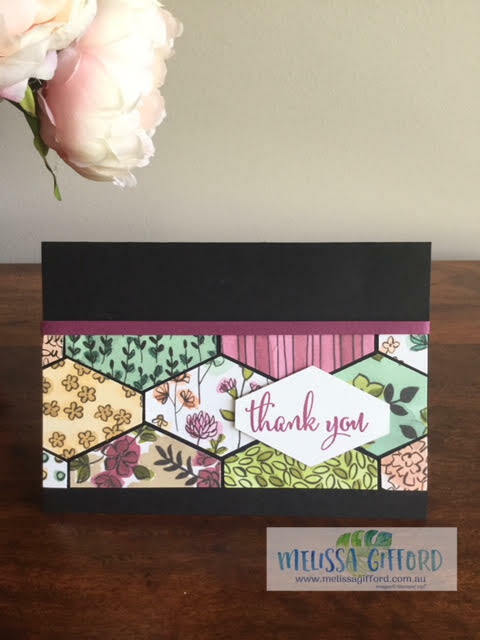 Melissa Gifford - Independent Stampin' Up!® Demonstrator: Got scraps? I don't know about you but I can't ever seem to throw out scraps of pretty papers and tend to hoard them but never seem to use them! Then I saw this card designed by Dena Rekow and a light bulb went off! This is such a simple design and yet packs a real wow don't you think? I punched out the designer series paper (in this case the Share What you Love Designer Series Paper with the Tailored Tag punch and glued them to card stock leaving a small border between each piece. I recommend placing them before you glue them down just to make sure you are happy with the look. I then added a really thin strip of rich razzleberry cardstock to finish it off. You could use glimmer paper, ribbon, anything you like - just use up those leftovers! Add a simple sentiment - again using the Tailored Tag punch and you are done! You can easily punch out a whole heap of these shapes in one sitting and then put the cards together when you need one in a hurry!